Karl Miller, the Wheatley Professor of Deer Management in the Warnell School of Forestry and Natural Resources, recently received the Southeastern Association of Fish and Wildlife Agencies’ highest award, the C.W. Watson Award, which is given to someone who has made the greatest contribution to wildlife or fish conservation in the previous year or years. Miller was honored with the award at SEAFWA’s annual conference in Mobile, Alabama, in October. 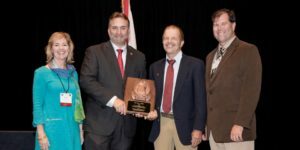 The Watson Award is presented jointly by the Southern division of the American Fisheries Society, the Southeastern section of the Wildlife Society and the Southeastern Association of Fish and Wildlife Agencies.